CBT can also be used to help people with sleep problems, anger management and problems with low self-esteem as well as a range of physical health problems. Our thoughts and feelings can play a major role in our behaviour and how we react to different emotions and situations. The goal of CBT is to help people suffering with their mental health to learn how to control how they respond to the world around them – whilst we cannot control the world around us, we can adjust the way we interpret and deal with our environment. 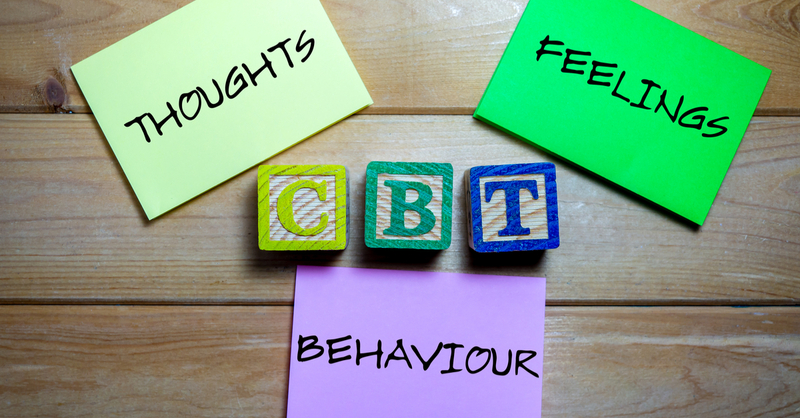 CBT is talking based therapy focused on changing the patterns that we so often fall into when we’re suffering with our mental health, by helping you to identify the thought processes and change the pattern of behaviour. CBT is often a short-term treatment option, although some patients continue to use CBT over a longer period of time. In recent years it has grown to become one of the most popular forms of therapy with both patients and therapists – and is considered the most effective form of therapy for a number of mental health conditions. Those suffering with their mental health often find themselves changing their behaviour based on their thoughts or feelings – for example, someone who spends a lot of their time experiencing negative thoughts around social situations may avoid them completely. During CBT your therapist will help you to break down the problems that you’re experiencing into four separate parts; the situation, thoughts, physical feelings and actions. You and your therapist will work together to analyse your thoughts, feelings and behaviours to establish the overall effect they have on you and your emotions. Once you and your therapist have worked out what you can change about your thought patterns and reactions to the environment around you, you can begin to practice these changes in your day to day life. Most therapists require you to keep some form of diary or to write down your thoughts and behaviour throughout the time you’re in CBT. CBT is a highly-goal oriented and focused form of therapy where you and your therapist will work together towards a mutually established goal. Once you have established what can be changed and how to change it, therapy sessions will focus on your progress with your feelings and actions and how to apply this to your daily life – even after you’re no longer in therapy. CBT is one of the most researched types of therapy and is the most effective form of therapy for a number of different mental health issues. Unlike other forms of therapy that focus on open-ended self-exploration, CBT is a form of structured and focused therapy, often lead by the therapist in an instructional role. It is better suited to those looking for a short-term treatment option for a specific problem – and can help you to develop coping skills that can be used now and in the future. For CBT to be effective, patients will be required to spend time analysing their thoughts and feelings – therapists will often set “homework” such as keeping a diary or writing down how you feel. Self-analysis – particularly when your mental health isn’t at its best – can be extremely difficult for some people and therapy is a lot less effective for those who won’t complete homework or practice CBT outside of therapy sessions. CBT is successful for many people with a range of different mental health issues from depression to PTSD. If you think you could be suffering with a mental health condition, or you have been recently diagnosed, CBT could be a great, short-term solution to get you back to better mental health as soon as possible. CBT – as a talking based therapy – is perfect for those who would prefer to partake in online therapy rather than face to face therapy. Online therapy is a great way to combine therapy into your already busy life and schedule, and doesn’t require you to leave the comfort of your own home. Visit our website to learn more about how CBT works and if it could help you with your mental health issues.